Home/Allah, Apologetics, Archaeology, Atheism, Bible Doctrine, Bibliology, Christology, Debates, False Religions, Historical Studies, Religions, Salvation, Theology Proper/Shabir Ally Debates Thomas Ross: The New Testament Picture of Jesus: Is It Accurate? The Christian, Thomas Ross, argued that the extant facts of history strongly supported the authorship of the four canonical Gospels (Matthew, Mark, Luke, and John) by their traditional authors. Consequently, the New Testament picture of Jesus Christ as the Divine-human Son of God and Son of Man who died by crucifixion for the sins of mankind and rose again from the dead reflects early and eyewitness testimony, indeed, testimony by Christ’s closest followers. Mr. Ross likewise argued that the traditional early dates for the Gospels set forth by the ancient historical sources strongly supported the accuracy of the New Testament’s picture of Jesus Christ. Furthermore, he argued that extremely early material in pre-Pauline material such as 1 Corinthians 15:1ff. similarly supported the New Testament picture of the Lord Jesus, as did the testimonies of the Apostles Peter and Paul, of James, Jude, and the New Testament as a whole. Mr. Ross likewise argued that theologically liberal theories of the authorship and dating of the New Testament are based upon a rejection of all ancient evidence and are baseless speculation. Theories of “Q” sources, Markan priority and literary dependence among the synoptic Gospels, source criticism, and other similar ideas have no support in the extant ancient historical evidence. The Bible, he argued, is the non-contradictory and historically accurate, indeed, infallibly inspired Word of God. Furthermore, Mr. Ross argued that the evidence and historical sources for the life of Christ as recorded in the Bible are vastly superior to and far earlier than the historical sources of the Quran and the life of Muhammad, so Muslims who accept the accuracy of the latter are inconsistent if they reject the accuracy of the former. The Muslim, Shabir Ally, argued in favor of the theologically liberal denial of the authorship of the four Gospels by their traditional authors and affirmed that late dates are correct. He argued that the New Testament and the Gospels generally were contradictory, and that an evolutionary development took place from the original Jesus, who was the prophet depicted in the Quran, not the Son of God who died by crucifixion as a substitutionary sacrifice and rose from the dead. Over time, this Muslim Jesus evolved into the Jesus of Christianity, through stages from “Q,” to Mark, to Matthew and Luke, and finally to John. Thomas Ross grew up doubting the existence of God, but during his freshman year of college, shortly before his sixteenth birthday, he turned from agnosticism and skepticism to Jesus Christ in repentance and faith and was born again. He subsequently joined a Bible-beliving and practicing Baptist church and continues to serve his Redeemer in that kind of a church today, believing that it constitutes the type of church found in the New Testament. He served as professor of Ancient Languages at Baptist College of Ministry and Theological Seminary for a number of years and now teaches Biblical languages, historical evidences for the Bible and apologetics, and theological courses at Mukwonago Baptist Bible Institute, a ministry of Mukwonago Baptist Church in Mukwonago, Wisconsin, as well as teaching internationally. In addition to studying his King James Bible, he regularly reads the Greek New Testament and Hebrew Old Testament as part of his devotional studies. He has read through the Greek New Testament multiple times, read the Hebrew Torah and much of the Tanakh, regularly reads the Greek LXX, and has translated the Aramaic portions of Scripture. He has recently started to read the Bible in Latin and read patristic Greek. He earned a B. A. from the University of California at Berkeley, a M. A. from Fairhaven Baptist College, an M. Div. from Great Plains Baptist Divinity School, a Th. M. from Anchor Baptist Theological Seminary, and is completing his Ph. D. with Great Plains Baptist Divinity School. He has written a brief statement of his reasons for turning to Jesus Christ in the work “My Journey from Unbelief to the Truth.” He has represented Biblical Christianity in a number of debates with leading representatives of other positions, including two debates with the leader of the Freedom From Religion Foundation, Dan Barker, over whether the Old Testament was fact or fiction and over whether prophecy and archaeology validate the Bible as the Word of God. 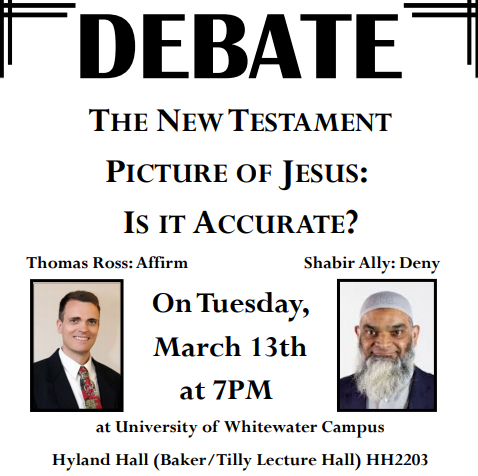 His argument in the Shabir Ally debate “The New Testament Picture of Jesus: Is It Accurate?” was largely based on the evidence in his forthcoming book God’s Fingerprint: Evidence for the Bible from Archaeology, History, and Prophecy. Portions of this work covering Old Testament and New Testament evidence are available online, as are other works of his defending and explaining Biblical Christianity, and also contrasting the case for Biblical Christianity with other ultimate commitments from atheism to Islam. Shabir Ally holds a B.A. in Religious Studies from Laurentian University in Sudbury, Ontario, with a specialization in Biblical Literature. He also holds an M.A. and a Ph.D from the University of Toronto with a specialization in Quranic Exegesis. He is the president of the Islamic Information & Dawah Centre International in Toronto where he functions as Imam. He travels internationally to represent Islam in public lectures and interfaith dialogues and explains Islam on a weekly television program called “Let the Quran Speak.” Mr. Ally is widely considered to be the most capable proponent of Islam in the modern Western world. 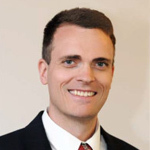 He has represented Islam in many public debates and discussions with figures such as William Lane Craig, Michael Licona, John Dominic Crossan, James White, Jay Smith, Nabeel Qureshi, Robert Morey, and David Wood. Dr. Ally is also the author of a number of works promoting Islam and critiquing Christianity. THE DEBATE VIDEO ITSELF IS NOT YET COMPLETED AND UPLOADED. PLEASE CHECK BACK AGAIN TO WATCH THE DEBATE ONCE THE VIDEO IS ONLINE.